Artist Velia Lala’s masterpiece gallery concept has come to life along the avenue. 30Avenue is the setting, but V. Lala Galleries offers a multifunctional and malleable space that is all at once an art gallery replete with original works by Velia and select artists, a unique retail boutique featuring artisan jewelry and pet couture, a boutique wine bar, an event space, and a “creation lounge” where Velia personally leads classes on a variety of art techniques. Born and raised in Louisiana, Velia has enjoyed a multifaceted career spanning more than thirty years. 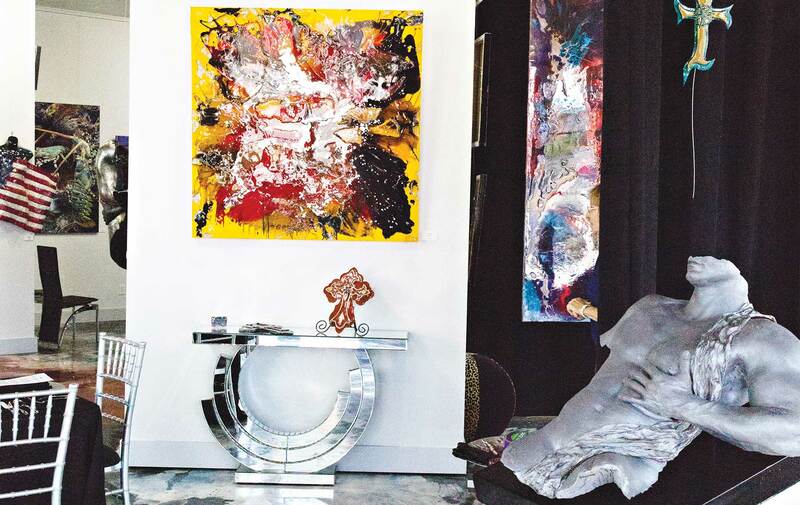 From abstract works to classical sketches to castings, her work frequently reflects her background and her zest for life. Velia’s original and custom works exude life and energy with their resilient colors and textures that evoke authentic and positive emotions. Her talent is showcased through a multitude of artistic media, including acrylic, mixed medium, high-gloss epoxy, photography, and casting/bronzing. Velia’s original and custom works exude life and energy with their resilient colors and textures that evoke authentic and positive emotions. Visitors experience the creative process immediately upon entering the gallery. The floors are a work of art created by Velia, and they flow throughout the main gallery space in waves of gray, black, and white. At the entrance of the creation lounge, pops of orange, blue, and red foreshadow the vibe of the space within. Worktables, blank canvases, drying canvases, and pieces freshly created by art class participants comprise the landscape. They are interspersed with Velia’s new and in-progress works, art supplies, palettes, and smocks and a milieu of paints, tools, and brushes that would inspire any closet Picasso. Perusing the gallery, visitors will notice the exquisite sculptures that adorn the space. Velia creates these life-size replicas of the human body, technically called life castings, from molds of human models. The finished products are so detailed and beautiful that they look like real people. From there, clients can choose a custom finish of plate (natural, bronze, or metallic), paint, or epoxy. In this instance, life comes to art—and vice versa. V. Lala Galleries offers a variety of classes each month with details updated on the gallery’s website. Private classes are becoming increasingly popular; they are often paired with wine and food from the gallery’s menu of boutique wines, small plates, and craft beers. Private classes are a blast and have also been used for special events, such as company team-building sessions, girls’ nights out, and bridal parties. Velia is an expert teacher who spends time with each student, focusing on his or her concept and creative process. (In some cases, the wine also assists, but I digress.) Everyone receives a twenty-four-by-thirty-inch canvas and has free rein within the creation lounge to choose tools, paints, and supplemental materials, such as beads, corrugated paper shapes, or epoxy. While art is the centerpiece of V. Lala Galleries, the space was envisioned as a multipurpose backdrop for private dinners, special events, corporate meetings, and fund-raisers for nonprofit groups. The gallery has an impressive ability to accommodate seated dinners for up to 110 people or cocktail receptions for up to 230. The space can be rented in full or in part based on your needs, with access to a catering kitchen, rental items, and on-site wine and beer offerings. A recent “mystery dinner” event garnered praise from the more than thirty attendees and provided a very entertaining themed evening. One very clever feature of the main gallery space is its hanging draperies. These fifteen-foot black drapes are on a unique track system, allowing the option to position them in multiple configurations around the gallery, creating the space that you need for an event or for specific artwork that can be hung on each panel. One always has the ability to create at V. Lala Galleries! While 30Avenue continues to blossom as a destination to see and be seen, the artistic heartbeat of V. Lala Galleries shall serve as its creative cornerstone.